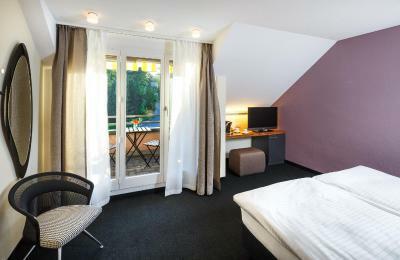 Lock in a great price for Kastanienbaum Swiss Quality Seehotel – rated 8.2 by recent guests! We liked the view from our room and the large room and bed were comfortable. Breakfast was good. Dinner was good but expensive. Parking was good. On the bus route to downtown. Hotel was in nice neighborhood. Excellent location, nice restaurant and very pleasant people! Very clean, amazing staff, amazing food, magical views. near to center by car and to many activity areas, so relaxing to stay there. And for sure I will come back again for more activities. 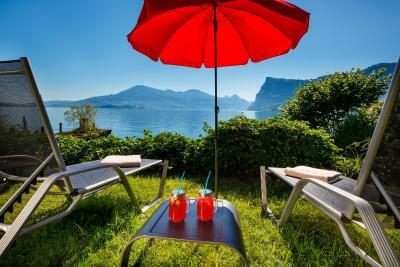 The place is located in the heart of an exclusive residential area on Lake Lucerne. The design and the available amenities clearly reflected that. Very nice place to rest up or to enjoy the recreational facilities in the area. Nice and calm neighborhood, lakefront with nice view on the mountains and lake. 7 minute drive to Luzern city center. The location is great and the view from the balcony is beautiful. The view from the room to the lake was amazing. We enjoyed the tour with the boat to Luzern. Wellness rooms are OK. Location. Beautiful. Free bus downtown and back. A boat comes to their dock to take you on a tour or to just take you downtown. Our lakeview room was wonderful - a beautiful panorama, very peaceful. The hotel staff were all very helpful with restaurants and things to do in Lucerne. Kastanienbaum Swiss Quality Seehotel This rating is a reflection of how the property compares to the industry standard when it comes to price, facilities and services available. It's based on a self-evaluation by the property. Use this rating to help choose your stay! One of our best sellers in Lucerne! 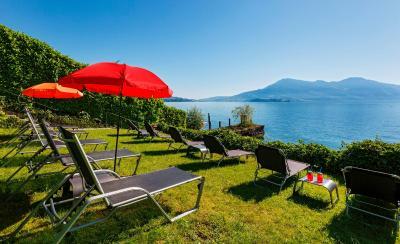 Located on the quiet Horwer peninsula, 15 minutes' drive from Lucerne's Old Town, the Kastanienbaum Swiss Quality Seehotel offers a sunbathing lawn as well as a spa area including, a sauna and a steam bath. A private beach and a heated outdoor pool are also available and open from May until mid-October. The Seerestaurant with a lake-view terrace serves tasty local and international dishes, . There is also banqueting rooms for up to 120 people and a large lakeside terrace. A garden and the Kastanienbaum Seehotel's own marina are at your disposal as well. You can easily reach the center of Lucerne by boat or public bus. From 01 January 2018, hotel guests receive a free public transport ticket for Lucerne upon arrival. This ticket is valid for all busses and trains within ticket zone 10 in 2nd class throughout the complete stay, including arrival and departure day. 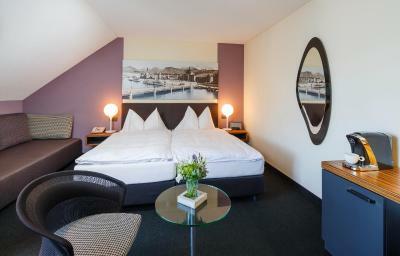 When would you like to stay at Kastanienbaum Swiss Quality Seehotel? 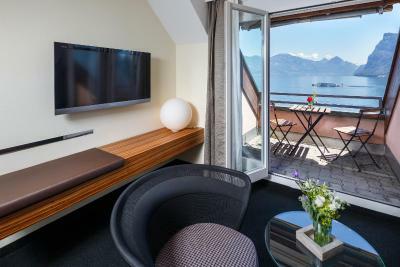 Newly refurbished, modern and bright room with views of Mount Pilatus. 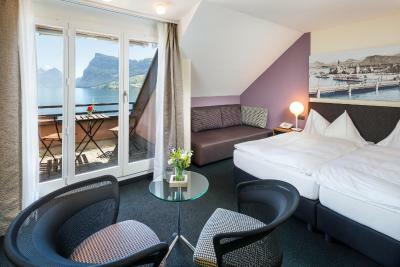 Some of the bright and modern rooms have a balcony overlooking Lake Lucerne and the mountains. This bright junior suite features a bathroom with a toilet, a mini-bar, cable TV, a wardrobe with a safety deposit box, as well as a small writing desk, a sofa and a balcony. This bright room features a bathroom with a toilet, a mini-bar, cable TV, a wardrobe with a safety deposit box, as well as a small writing desk, a sofa and a balcony. This modern and bright room features views of Mount Pilatus. This bright room features a bathroom with toilet, a mini-bar, cable TV, a wardrobe with a safe and a small desk. House Rules Kastanienbaum Swiss Quality Seehotel takes special requests – add in the next step! Kastanienbaum Swiss Quality Seehotel accepts these cards and reserves the right to temporarily hold an amount prior to arrival. Please note that the outdoor pool is open from May to September. Please note that the spa area is closed on Mondays. If your stay includes a Swiss national holiday, please contact the property in advance for opening hours of the spa. Cold staff on arrival who complained because we forgot to mention the infant on our booking. The pillow was too thin, couldn't sleep well with this kind of pillow. The towels were quite small. I was surprised that the 4-star rating of the hotel didn't match the room quality. And that didn't even include breakfast in the price! Our first in Switzerland that breakfast was not included in the hotel price. The location, the room overlooking the lake. Sauna and Spa facilities close on Sunday which should be written on booking.com and the hotel website. The breakfast was not a buffet, plates of food were served. Staff at breakfast should be more attentive. I had to make a requested for egg dish which is included in breakfast. Limited variation of food, no yoghurt, no Muesli, no Croissant. 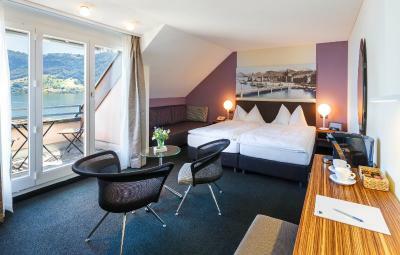 Beautiful view form a room with baclcony, easy to reach from Lucerne train station and free local transportation ticket. If you're a sauna liver, be aware that the wellness is closed on Sundays!! Stunning views and great food! Go for a room with Lake view. Very surpris house! Wonderful View! And Lovely landlord! Service is best! Hope back soon again! Thank you all! The bathroom in our room was inconveniently arranged. The shower curtain was dirty, towels were frayed, trashcan broken, no grab bars to access an awkward bathtub, no hand towels provided at all and no wash cloths replaced after the first night. The location is a drive from downtown so if you don't want to take the bus, taxi or private car, your only option is the hotel dining room. Menu is in German & waitstaff could not translate all of it. The terrace was closed too early. Fabulous location with stunning views. Good restuarant. Lovely staff. Fantastic location, super friendly staff, great breakfast. We loved it.